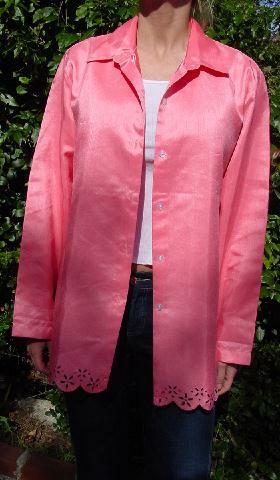 This 100% polyester pink-apricot jacket is by Style Studio. It has a somewhat shiny exterior with a periodic vertical textured thread design. 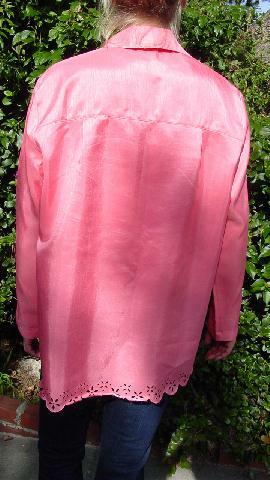 There are six iridescent white buttons down the front. The interior has a smooth very shiny surface. It has a shirt collar, long sleeves, and scallops around the bottom edge. Above the scallop is a cutout flower dot design which also goes around the bottom area. There are 4 3/4" side seam bottom slits. The left chest area has a small darker area about 3/4" wide by 1/4" high. It was there when it was originally purchased. She wore it as a jacket.